SEASON FOR SURRENDER Blog Tour: What’s In a Name? Thank you, RomFan Reviews, for hosting me today! 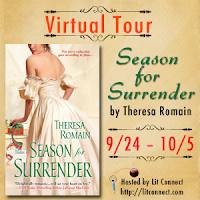 I’m glad to join you as part of the blog tour for my new historical romance, SEASON FOR SURRENDER. *they both puzzle out an encoded book, collect mistletoe, face their greatest fears…and, of course, find love. Today I’ll tell you a few behind-the-scenes secrets about how I picked the character names in this book, starting with the hero. Alexander, Lord Xavier, played a minor (villainous!) role in my romance debut, SEASON FOR TEMPTATION. I came up with his title first and liked pairing it with another name that contained an X. Don’t you think of him as sort of sharp and haughty, with all those X’s in his name? And so everyone thinks he is. But are they right about that? Not really, as the heroine soon learns. Jane Tindall, a distant cousin to Lord Xavier, attends the house party and befriends Louisa. Her last name honors Milo Tindle, the sneaky, smart character played by Michael Caine in the movie Sleuth. Jane shares those qualities, so she gets to share the name too. As for Jane’s first name, I wanted to pick something plain and sensible to suit her character. It just now occurs to me that I owe Miss Austen another debt, since I borrowed her own first name for this! Lord Lockwood, the book’s villain, and Lord Weatherwax, a friendly and constantly tipsy house party guest, both got their names from the crew credits of British-made movies. Inspiration can lurk anywhere, right? What are some of your favorite character names from books or movies? Leave a comment to let me know! 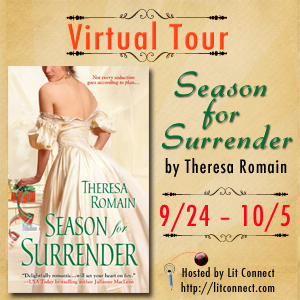 I’m offering a signed copy of SEASON FOR SURRENDER to one commenter, open internationally. Heat Level: Sensual: Love scenes with euphemisms. FOR SURRENDER. Contest is open internationally. Earn an extra point for ‘liking’ Theresa on Facebook and ‘following’ her on Twitter! Contest ends on October 5th. Ladies, thank you so much for hosting me! It's great to join you today. Thank you Theresa for being here. I actually have my Dad to thank for finding your books. He does our family tree and is always doing searches and he came across your name and he called me and asked if I had heard of you and maybe we are related. See my maiden name is Romain. So of course I went out and bought your first book but will admit it is on my TBR shelf and I am gradually working my way through the stack. 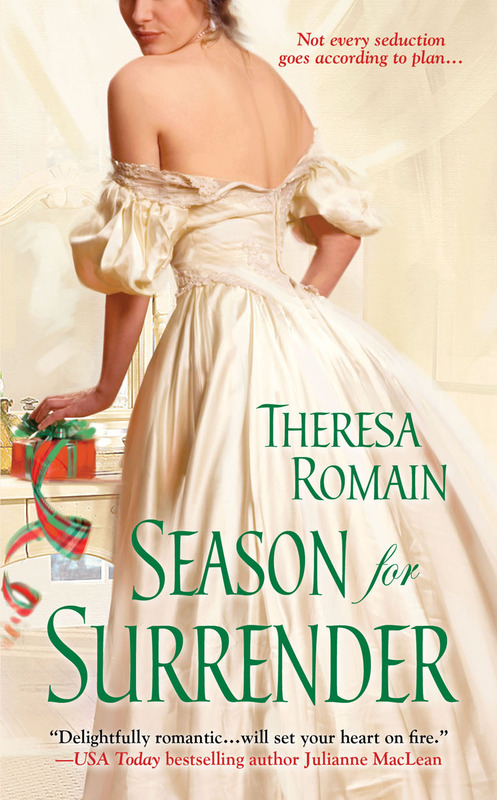 I look forward to reading Season for Surrender. Annette, what a cool story! And very fitting for today, since my post is about names. 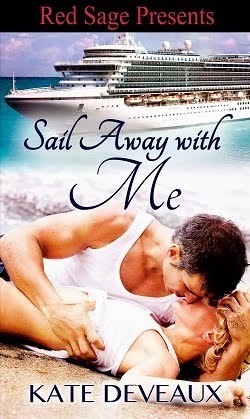 :) Thanks to your dad for finding my work, and thank you for adding my book to your TBR shelf! I like Sebastian from The Devil in Winter. bn100, thanks for visiting. Sebastian is a great hero's name! Arya from Game of Thrones! I've been reading the reviews on this book and so far all of them are good. Hey, that's good news. :) Thanks, Alyn! Game of Thrones has some very cool character names, doesn't it? One of my most favorite characters name is Adrian or Simon. I absolutely love those names. Both excellent romance-hero names. :) Thanks, Melanie! I don't really have a specific favorite name from novels, but I do like different, unique, or rarely used ones. One of my favorites would be Bastian though. Ooh, nice one, June. 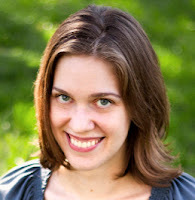 Shana Galen wrote a great Bastien in THE ROGUE PIRATE'S BRIDE. Have you come across that book? Some of my favorite ladies names are Charlotte, Juliana, and Arabella and for men - Sebastian, Nicholas, and Lucien. Barbara, thanks for sharing your favorites. Those would all fit beautifully in a historical romance! Oh I like the names you chose for your character and why you chose them.. I love Jane Austen. I don't have favorite names, but I like them to be appropriate for their character. Kristia, thanks for stopping by! I figure if Jane Austen used a name, then it's definitely ok for a Regency romance. Plus I like to honor her work--she's the writer who got me interested in the time period. Congrats on the new release. This book sounds fantastic. Can't wait to read it. Thanks for the great post. Some of my favorite names are Nicholas, Adrian, Ian, Rebecca, Nicole, and Allison. Joanne, what classic names. Thanks for sharing them! Hope you enjoy SEASON FOR SURRENDER. Thank you for sharing with us! Some of my favorite character names...Devon, Madison, Meghan, Chase, Morgan, Sebastian & Tristan.